This OpenG Review is closed. 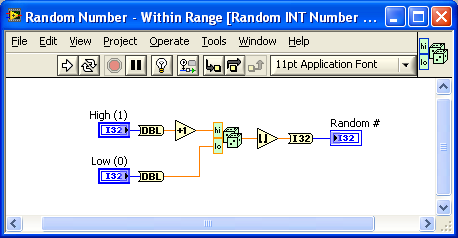 Based on Jim's suggestion in my post Select Random Array Indices, I submit this VI: 'Random Int Number - Within range'. 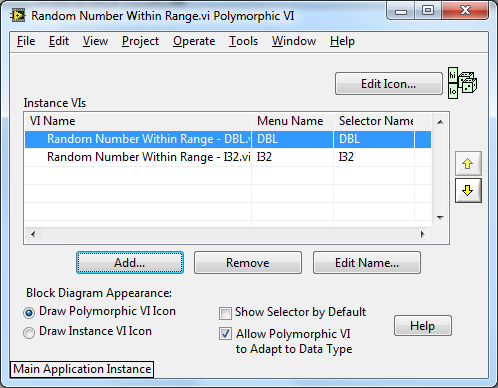 The existing OpenG Random Number VI would presumably be renamed and added to a polymorphic VI. I chose I32 data types for compatibility with array indexing functions. The default values of one and zero allow this to be used with 'Not Equal to Zero?' to simulate a coin toss. 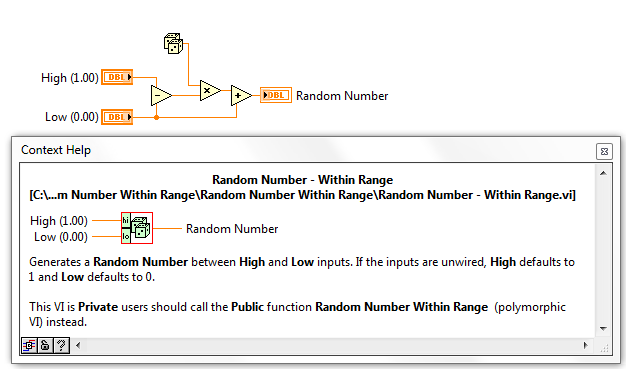 I was going to provide a link to the existing OpenG 'Random Number' documentation. A Google search found that Jim already submitted something similar to the old OpenG forums, see here. Jim mentions that the high and low are negatively biased and solves this by adding one to the high value and then rounding down. I think his is better. Rather than duplicate Jim's post and test code, is there a way we can import the discussion from the OpenG board to the LAVA board? I am sure everyone who is interested in the discussion can click to the OpenG archive and read the OP. Keep that thread going by posting in this LAVA thread, no worries. 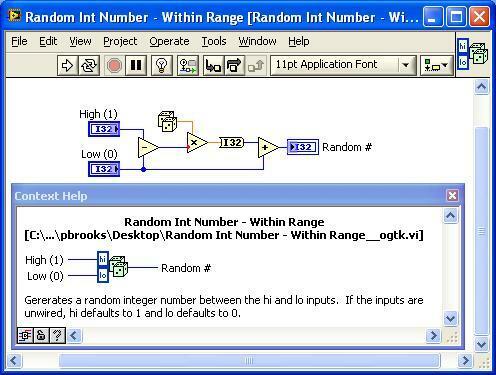 I propose that we add support to the "Random Number - Within Range" for integer values by making it a polymorphic function that outputs a uniform distribution for integer inputs (that includes both the Low and High input values). Behavior for floating point inputs would remain unchanged. Let's look at why this happens. Say we have a range from 1 to 10. Values from 1 to 1.5 will be rounded to 1. Values from 1.5 to 2.5 will be rounded to 2, values from 2.5 to 3.5 will be rounded to 3, ..., ..., .., values from 8.5 to 9.5 will be rounded to 9, and values from 9.5 to 10 will be rounded to 10. As you can see, the values of 1 and 10 each occur in a range of 0.5 out of 9, whereas the values of 2 through 9 each occur in a range of 1 out of 9. 1 and 10 have half the rate of occurence of 2 through 9. 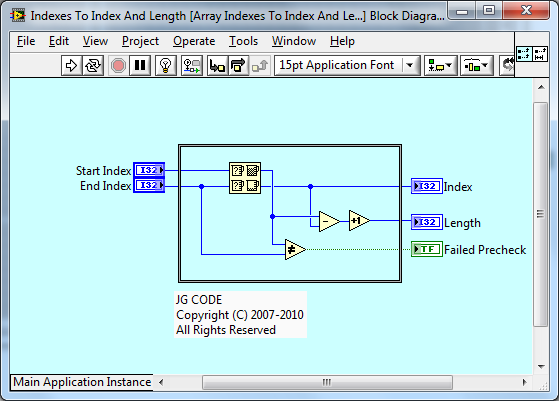 Convert to Poly VI or create a new, seperate VI for integers? I'm in favour for such a VI. A) I definitely would not provide default values for those input terminals. Make them required. I can't believe that the majority use case is going to be coin flipping between zero and 1. If you want to write a specialized "Coin Flip.vi", fine, but give that one a boolean output. B) What happens if High is less than Low? Perhaps an absolute value node should be added to the subVI? I would suggest to make the Upper limit required, and check for the min/max (use the native sort 2 number primitive). And I would make this a polymorphic VI with all the Int/UInts and double. I like the 'Max and Min' function rather than the absolute value. I think we would have to subtract one from the improperly entered High value (less than low) and then round up in order to get the proper distribution. That would make the function overly complex. Please note that there is fairly complete collection of VIs for various data types and some extensions (like random array elements) located in sourceforge. They were submitted some time ago by dafemec as part of the thread I copied and pasted from. So; I start a thread about a random array subset vi. 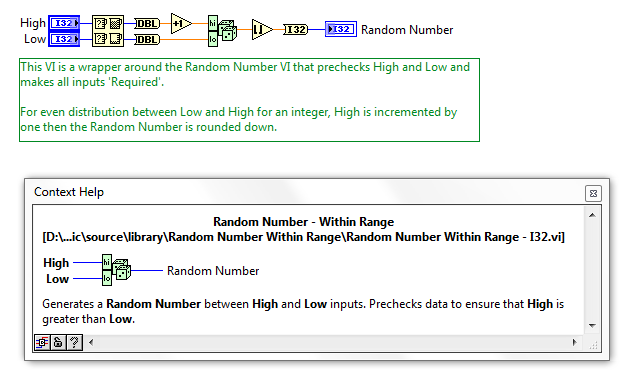 A suggestion was made to maybe be a bit more simple and extend the existing random number function. I create an example, the find a nice collection of stuff. This stuff includes datatype specific versions of the function that started the whole discussion. What do we want to do? Should we load the sourceforge files into this thread? I would do whatever makes it easy for reviewers to get to the code to contribute to this thread. I vote to add an I32 VI (using Jim's code) and polymorphize the API. We can look at supporting more datatypes in the future when there are good enough reasons to do so. I agree. This extends a useful function and makes good code reuse. True also convert the lower to double to avoid the coersion dot. FWIW, there's two conversion dots there. I've renamed the existing function to include DBL, created a polymorphic VI using the original function name and added the INT version. I also added the conversion to/from DBL to avoid the coersion. (see image). A) I definitely would not provide default values for those input terminals. Make them required. E.g. when converting a Start/End Index to Index/Length for arrays, I do the precheck and also output a pass result (if ever of interest). We could do something similar here however, I recommend we depreciate the original VI as this will cause a behavior change of the function. If we depreciate the VI, then IMO we should also do A) and make the inputs required for all new VIs. The attached code also contains the I32 Evenly Distributed example from the OpenG Forums (linked to the new code). I have changed this review to pending. If no one has any further comments I will close the review in a few days.